The drop in oil price will have a salutary effect on the economy of the Euro Area. The lack of commitment between oil producers at the OPEC meeting in Vienna on Thursday the 27th implies a continuous slide in the oil price. This situation reflects a very peculiar situation on the oil market which is in excess supply. 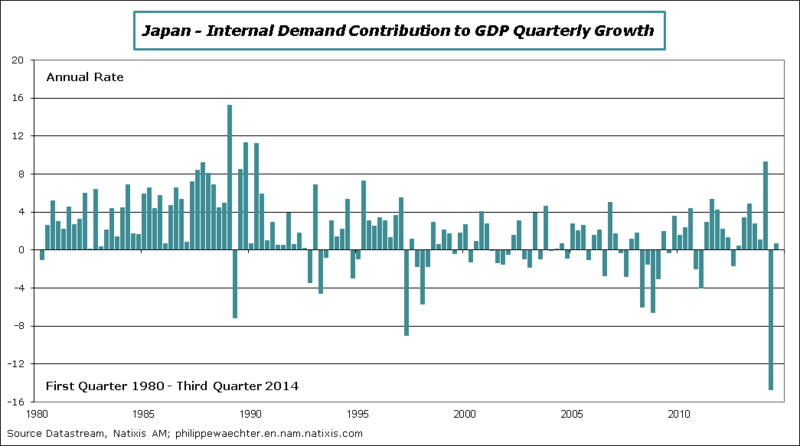 Demand’s dynamics is limited because of the gloomy global growth momentum. At the same time, production is at a high level. Every producer tries to improve its revenues by increasing its own production or by maintaining it at a high level. US GDP growth has been revised on the upside for the third quarter. In the first estimate it was 3.5% at annual rate. It is now 3.9% with the second estimate. Daily Column – IFO Rebound in November: is it sufficient? Monetary policy management is now more complex than what we expected a few months ago. At this time, the focus was made on US monetary policy and the moment where the Fed would increase its interest rates. We had in mind that the end of asset purchases would be closely related to the rate hike. What can we Learn from the Week of the 17 November? On Monday, I record a podcast in French (here) on macroeconomic news of the previous week and on macroeconomic news expected for the week to come. What can we learn this week? Companies’ surveys have shown, on average, a lower momentum in November. In the United States, the PMI/Markit survey still shows a robust growth profile but with a weaker trend than during last spring. This can also be read in production indices. The manufacturing production index published by the Fed was in October growing at the moderate pace. On a 3 month change basis, it was up by 2% compared to +7.2 % last June (annual rate). 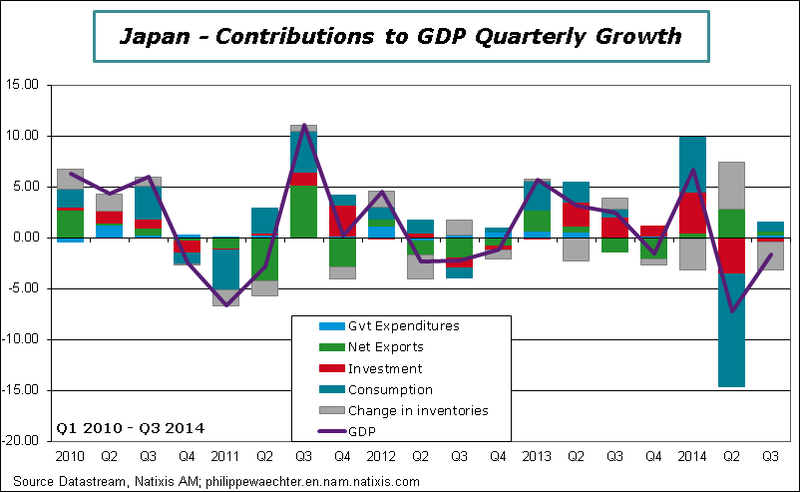 The Japanese economy is back into recession. After the deep drop of the second quarter due to the VAT rate hike on April the first, the negative momentum has not been reversed. (see chart 1). GDP dropped by -1.6% at annual rate in the third quarter after -7.3% during the second quarter. Compared to Q3 2013 GDP is down by -1.1%. Carry over growth for 2014 is still positive but by a mere 0.2%. It seems that Shinzo Abe has postponed the second VAT rate hike that was scheduled for October 2015. He is right as in a very weak global environment, the Japanese economy will have to find resources in itself to converge to a growth trajectory. A new negative shock is not necessary. 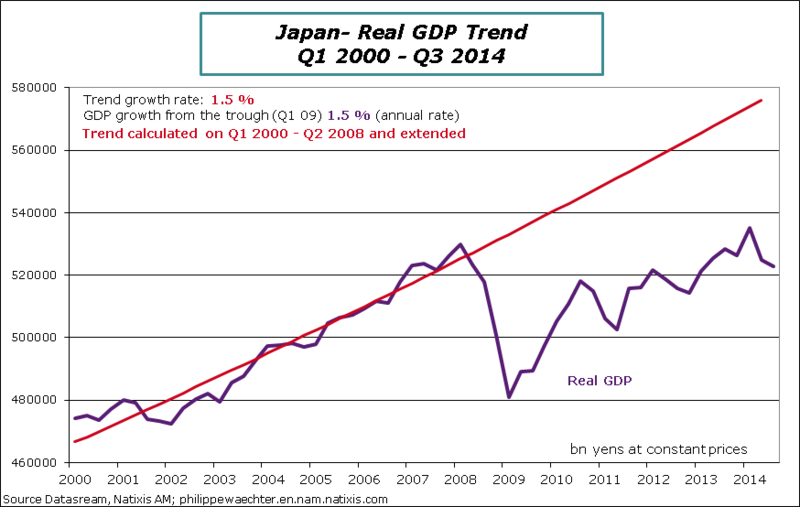 It will be complicated for Japan to escape to a long recession. From my point of view, we can expect a recession of several quarters. In 1997 after the VAT rate hike, the shock was milder than the current one but the recession lasted 5 quarters. The very accommodative monetary policy can help to recover. Weaker yen and negative real interest rates will help.